Spring has definitely sprung here in Sydney. But the nights are still cold, and some winter classics are still on the menu, for, oh, another week at least. I don’t cook lamb shanks often, partly because I’ve never been able to settle on a favourite version, and because my previous oven used to have a hard time cooking anything to falling off the bone without incinerating it. 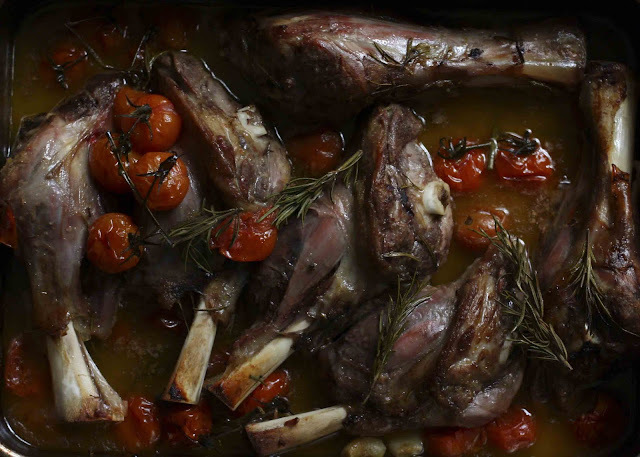 But all is about to change, because I have fallen in love with Guy Mirabella’s new cookbook Hungry, and in particular his knockout lamb shanks with muscatel grapes and tomatoes. I’ve adapted it to a weeknight version, because my butcher rebuffed me when I asked for the shanks to be frenched. “What a waste of good meat,” he cried, and threw them into a bag before I could mount a case for the aesthetics of Tao. Hence, dear readers, this is the caveman version, easy to pick up, cutlery be damned. Wash the lamb shanks and pat dry with paper towel. Rub the lemon zest and juice into the shanks and season with salt and pepper. Pour the oil into a large, deep roasting tray, place the shanks on top and scatter on the rosemary, garlic, the butter and tomatoes and shake. Pour in the wine and the Marsala and cover with foil. Roast for 40 minutes and then remove from the oven. Turn the shanks and baste with the pan juices, cover and return to the oven for 40 minutes. Baste with the pan juices again and sprinkle on the extra rosemary sprigs. Roast uncovered for an hour, or until the meat pulls away from the bone. Transfer the shanks, garlic, tomato and rosemary to a serving platter and cover with foil. Scrape the residue from the sides and bottom of the roasting pan, and place the pan over high heat for 5 minutes to simmer the sauce until it has thickened slightly. 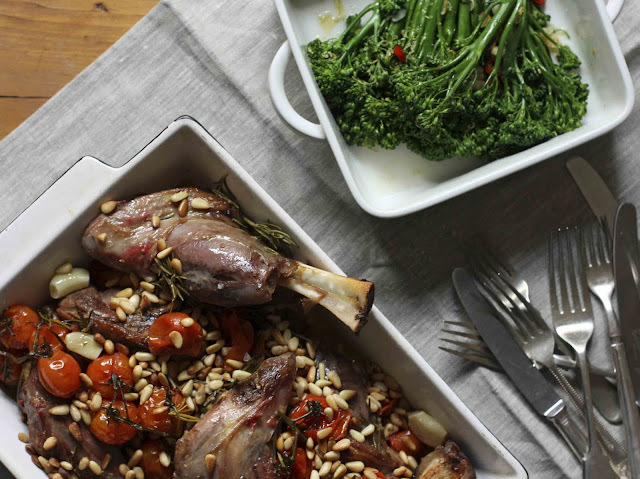 Pour the sauce over the shanks and serve, garnished with the rosemary sprigs, toasted pine nuts and if you feel like it, extra lemon wedges. Serve with blanched broccolini tossed in garlic, lemon juice and zest, and chilli. Couscous is also great for sopping up the juices.